Published: Aug. 11, 2014 at 04:14 p.m. Updated: Aug. 11, 2014 at 05:18 p.m.
We're through a full week of preseason, which means we've had a chance to see a large number of players show their wares. That's the perfect time to note who helped or hurt their fantasy draft stock. The Saints rookie has terrorized his defensive teammates throughout training camp. 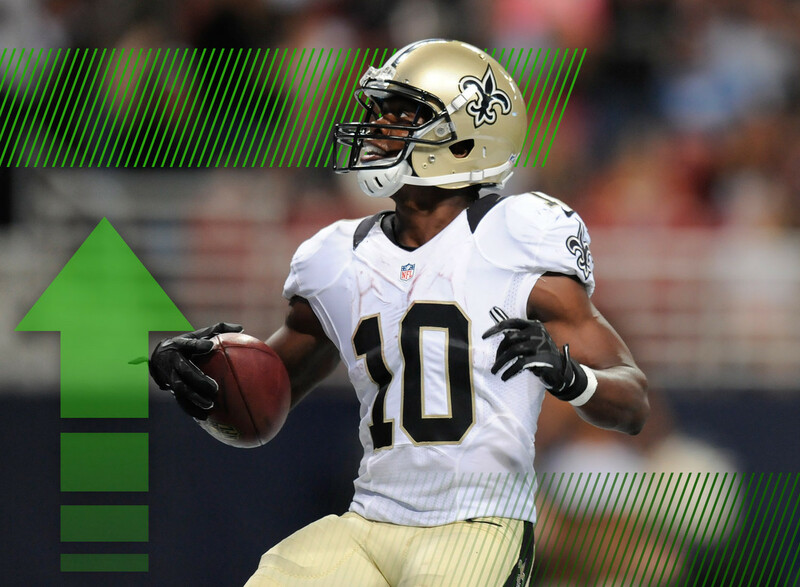 Over the weekend, New Orleans unleashed him on the St. Louis Rams. Cooks tallied five catches for 55 yards and a touchdown, showing that the training camp hype appears to have some merit. In an offense that spreads the ball around amongst its pass-catchers, Cooks will have plenty of opportunities to be a fantasy impact player in his rookie campaign. While the noise around Brandin Cooks looks legit, the hype around Bridgewater seems a little more inflated. The rookie quarterback had a rough time against the Raiders on Friday night, completing just 6-of-13 passes for a paltry 49 yards. We'll see if Bridgewater continues to see reps with the first team, but for now it appears Matt Cassel's job is relatively safe. Whatever growing pains the rookie might be having during training camp, he was able to shake them off in a nice debut against the Dolphins. Steven Jackson is on the shelf for the forseeable future and Jacquizz Rodgers been merely adequate in his first three NFL seasons. That leaves an opportunity for Freeman to start stealing snaps right away. Posting 107 scrimmage yards (including a 57-yard catch) in your first preseason contest is a nice way to do that. It's not that Woods has performed badly in the preseason -- it's that he continues to see action with the second team. Sammy Watkins is locked in with the starters while Mike Williams and Chris Hogan are getting more first team reps. Coming into the 2014 season, Woods had the makings of a fantasy sleeper. That's hard to achieve if you're not on the field. The Jaguars have repeatedly said that they have no plans to start Bortles this season, but the rookie might force the team's hand if he continues to play the way he did Friday night. The No. 3 overall pick looked fairly comfortable while completing 7-of-11 passes for 117 yards. Jacksonville will still probably go into the regular season with Chad Henne under center, but don't be surprised if Bortles takes over before the year is out. He has good dynasty league value. As the first running back selected in this year's NFL Draft, the expectations were high for Sankey. His preseason debut, however, was underwhelming. Sankey's three catches for 38 yards and a touchdown helped offset a night that saw him carry the ball 13 times for 37 yards. With Shonn Greene and Dexter McCluster lurking to grab more playing time, Sankey will need to show more in subsequent games. The Hall of Fame Game was not a fluke. Williams is not only very much in line to be Rashad Jennings' backup/fantasy handcuff with the Giants, but also has the chance to produce in his own right. The rookie has the makings of a short-yardage back that can slide into the role once occupied by Brandon Jacobs. His value near the goal-line should make him worthy of consideration as a late-round option. Fitzpatrick wasn't the only thing wrong in the Texans' 32-0 loss to the Cardinals on Saturday. But then again, the veteran quarterback wasn't part of the solution either. The interception bugaboo that has plagued Fitzpatrick at times during his career reared its ugly head again with the Texans' signal-caller tossing a pair of picks in a short outing. Fitzpatrick's ceiling was as a low-end QB2 this season, but he won't come within sight of that plateau without some major improvement.